Skip the Caribbean vacation. 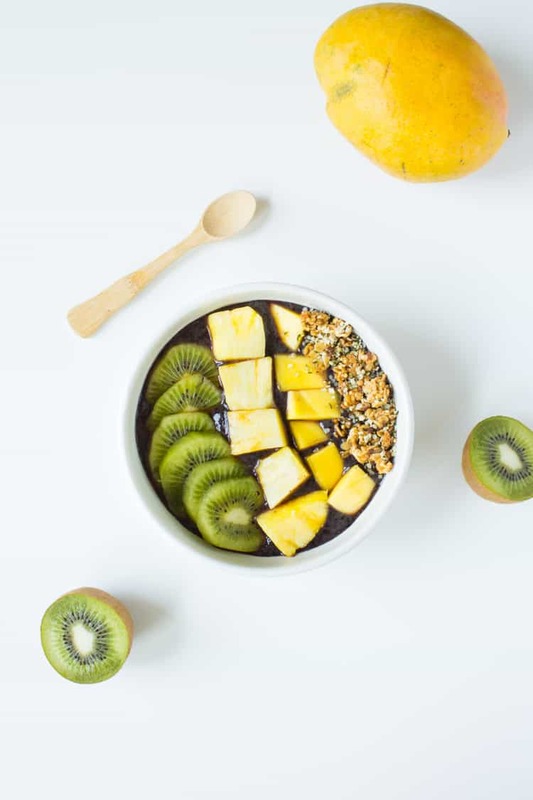 This tropical acai bowl, packed with antioxidants, will make you feel as if you’ve transported yourself to a tropical island. It’s been serious summer weather here in Boston this week. As I type in a tank and short shorts in my bedroom because it’s the coolest room in the house, sipping on an iced chai latte. It’s the only way I can survive working from home on these hot days while the AC unit hangs out in the storage room in the basement (yes, Steve, I’m looking at you). And with the heat, all I’ve been craving is cold foods. 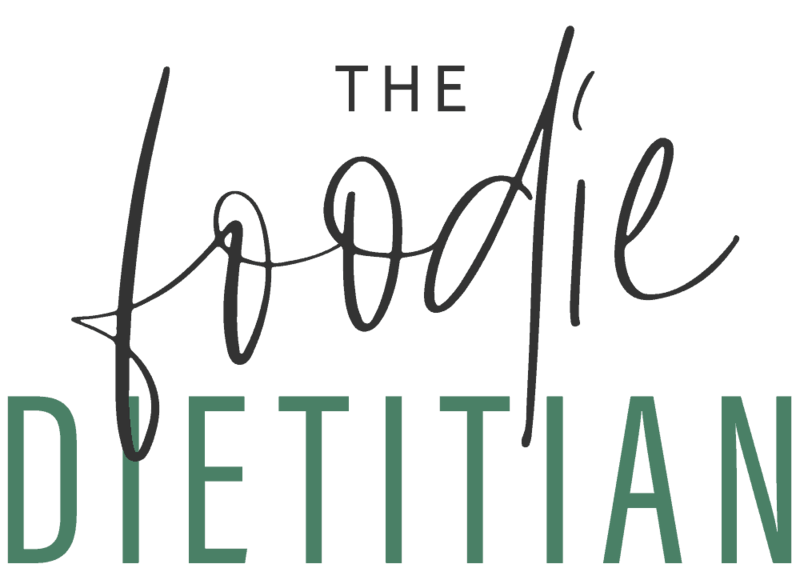 Salads, smoothies, popsicles, cold drinks, fruit, and more popsicles (get ready…they’re coming to a blog near you). A girl can only sip on so many smoothies though so I decided to make something a little more substantial this week – an acai bowl. I was on a big acai bowl kick last year and would have one for breakfast every morning. I’m not sure when or where the acai bowl binge ended but I have a feeling it had something to do with colder temps and an influx of oatmeal. But with the rising temps my smoothie bowls are back in action and acai bowls are no exception. 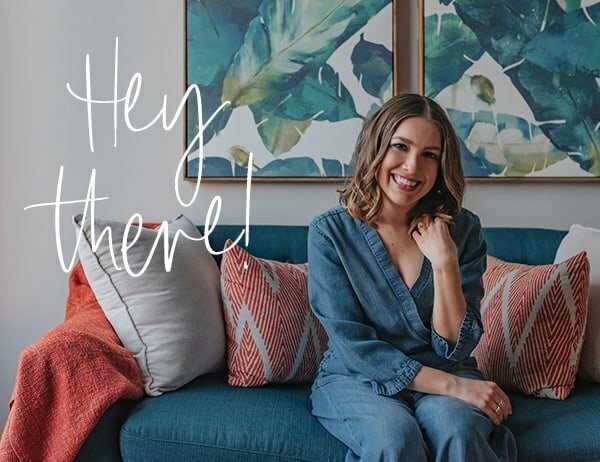 If you’re currently saying to yourself, acaiwhaaaa?, let me explain. 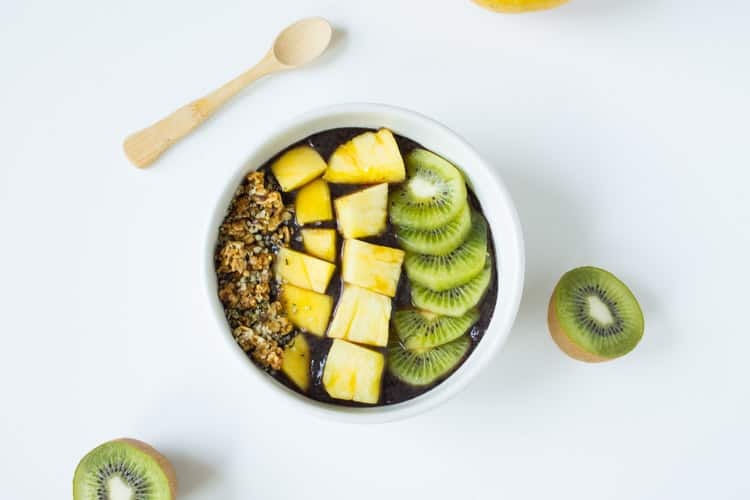 Acai is a berry found in Central and South America that is loaded with antioxidants but unlike other berries, is also packed with omega fatty acids. Yep, this berry contains healthy fats – I kid you not. And when we combine carbohydrates (found in fruit) with fat or protein, we have a better blood sugar response and feel more satisfied. 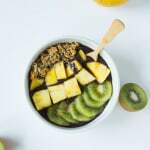 Now there’s been a lot of hype over acai the last few years with lots of crazy claims like acai can help you shed pounds. Don’t eat acai to help you lose weight. Eat acai just as you would any other berry – because you like the taste and it’s packed with nutrients. Don’t expect any hocus pocus magic though. Look for acai berries at specialty groceries or use freeze dried acai berries (aka acai powder), which is what I used in this smoothie bowl. One of the reason I love acai bowls (and any smoothie bowl for that matter) is that the possibilities are endless when it comes to toppings so you never have to get bored. Since I was feeling the heat (literally) this week, I decided to make a tropical bowl with all my favorite tropical fruits like pineapple, mango, and kiwi. And then finish it off with some granola and hemp seeds for good measure :). 1. In a blender, add banana, acai powder, coconut milk and blend together until smooth. 2. Pour acai mixture into a bowl and top with fresh fruit, granola, and hemp seeds. Tell me, have you heard of acai? Have you ever tried an acai bowl? 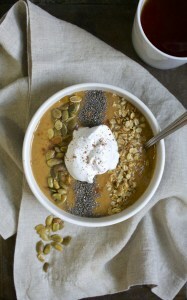 If you liked this recipe, you might also like my pumpkin pie smoothie bowl. This looks perfect for a hot summer day! Ahhhh sounds perfect for my Florida summers! Made popsicles this week because it has been so brutal! Yes! I’ve been all over pops too! 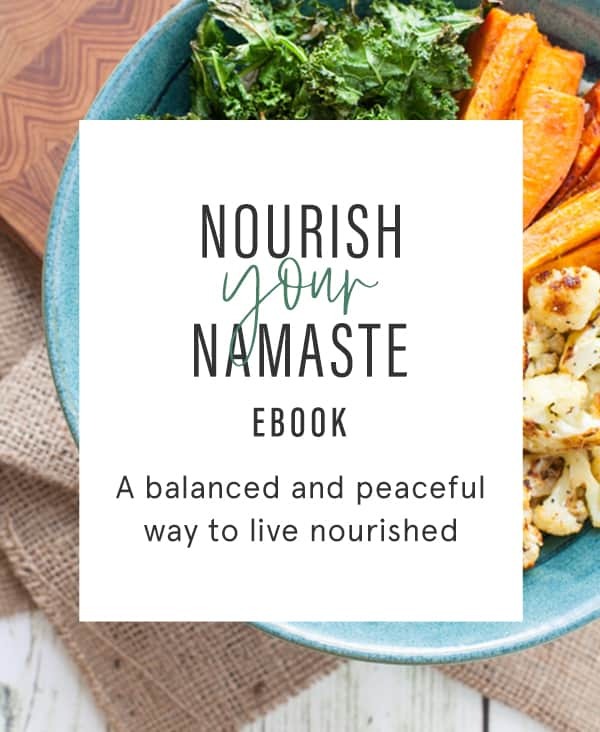 acai and smoothie bowls are my favorite and this looks particularly delicious! I just wish acai powder wasn’t so expensive! I hear ya! At least a little goes a long way. Thanks, Nicole! Ahh so hot this week- I’ve been suffering without our a/c set up too! I’ve never had acai powder- I usually buy the frozen packs- but I could swim in this bowl right now, sounds so refreshing!